So Cabot Circus is all set to open on schedule on the 25th September — good going for a major building project so close to the city centre, and one which has involved the re-routing of main roads. Quite why we need a shopping centre next to an existing shopping centre defeats me. 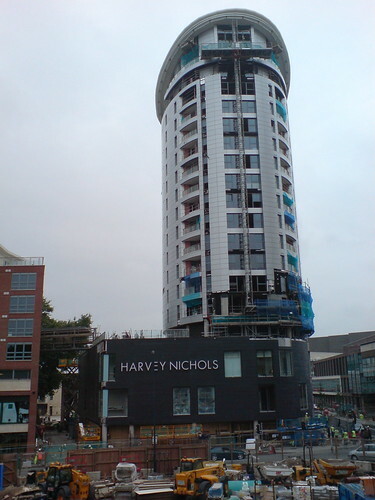 Here’s a picture taken at the beginning of the month showing Harvey Nichols occupying the prime location previously occupied by Argos and £1 shops. On the same day I took a picture of work in progress on what used to be the Bristol Industrial Museum and is due to become the Museum of Bristol. 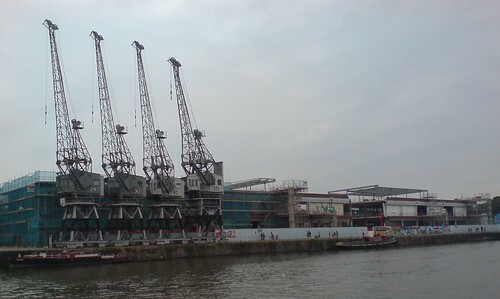 The museum sits right on the harbourside, occupying a couple of 1950s transit sheds. It has a fine collection and used to be a great place to visit. With a bit of planning I’d have thought they could keep one half open while they refurbished the other. Not so. Development runs late. Work started in 2006 and originally scheduled to complete in 2009 is now due to finish in 2011. The sheds will be fully and sympathetically renovated. Their historic character will be preserved and a stunning glass rooftop gallery will be added to create an additional exhibition space. I took the photo from outside the Arnolfini, Bristol’s leading centre for contemporary arts, which is housed in a “sympathetically renovated” tea warehouse and which, like the Industrial Museum, was closed for an extended period for refurbishment. Now reopened, it seems to have lost momentum during the redevelopment, losing gallery space and gaining a thumping great lift as its centrepiece. Somewhere our priorities are wrong. Carboot Circus. Send in the clowns.